Chasing’s music and dance styles contribute to its uniqueness, but what is most important about the team is its members. “We emphasize team diversity, so we have members from various countries,” Chang said. Yonaha agreed, saying that the “various backgrounds” represented by the team’s members contribute to Chasing’s emphasis on the importance of diversity. As a result, Yonaha is always excited to see new members join. “When we performed at the Culture Show, we only had three members, but [Chasing] has been getting bigger and bigger. Now, we have seven dancers on our team!” Yonha said. Despite the importance of Chasing’s individuals, group effort is a key factor to the team’s success, according to team member Aubry Miller ’22. “For me, Chasing is a group of people who genuinely love dance and enjoy sharing their passion for it. This team makes it easy for our unique talents to shine and enhance the group as a whole (independent minds, dancing together),” Miller said. Member Bang Nguyen ’22 especially enjoys Chasing’s charismatic and welcoming atmosphere. “Practicing for the dances is not an intense activity, but an enjoyable time, as our members are really funny and quick learners. Everyone is welcomed and treated with respect and care,” Nguyen said. Nguyen also mentioned that the team likes to celebrate their performances with “good-job parties,” where the members make good food together and have fun. According to Chang, Chasing hopes to attend hip-hop competitions, so practices will be held every week. Showcases will also occur throughout the semester so the team can gain more experience onstage. General dance workshops will also be held this semester, the first one likely to take place in February. 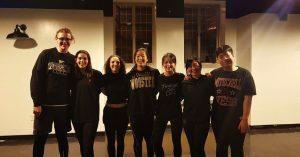 If anyone is interested in Chasing or would like more information about practices, showcases or workshops, contact Mika Yonaha (MYonaha21@wooster.edu) or Cloud Chang (LChang21@wooster.edu).